WARNING: This entire post is me getting on my soapbox to rant about the idiocy that the snack market has turned into. If you aren’t here for that, find your way to some of our other fare. There’s been chicken and waffles flavored Lay’s chips. There’s been roasted turkey flavored Doritos. And now, the bright minds at PepsiCo are testing Doritos-flavored Mountain Dew. I’m all for trying new things. When you use your ingredients in new ways, the result can be surprising (in a good way). Potato chips on a sandwich? Yes. Vanilla Coke? Odd, but it gets a pass. Doritos Mountain Dew? Not so much. Mountain Dew is already known for its medicine-like flavor; there is no need to exacerbate the oddity that is the Dew. Look past the strangeness of that flavor combination and just think about the fact that they have flavored a drink to taste like a chip. In what reality does that even sound like a good idea? What’s next, Funyuns-flavored Fanta? What happened to the time when food was flavored to taste like what it was? If you wanted buffalo wings, you’d get some buffalo wings and eat them. You wouldn’t get something else that was formulated (using the “best ingredients”, I’m sure) to taste like them. It is bad enough that Taco Bell is making taco shells out of Doritos chips. Must every snack now taste like something else? I’m not sure what is driving this craze more, the increasingly sedentary life of Americans or a snack market that if bereft of any fresh ideas. Either way, this marks a new low for the snacking industry. 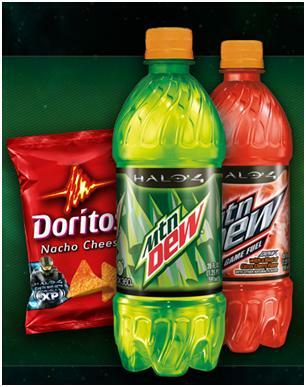 Would you drink Doritos-flavored Mountain Dew? Tell us in the comments section below!